The outdoor portion of your home – your backyard, patio, deck, or outdoor kitchen – should be an extension of your home, and an extension of your living space. You want it to look good, feel good, and be functional. You want it to be able to withstand the elements, and you want it to last for a long time. Have you considered adding Outdoor Accents made from granite or natural stone to your outdoor living space? At Granite Accents, we understand where you’re coming from, because we want the same things at our homes. Our custom outdoor work can give your home’s outdoor space the wow factor that you’ve been chasing, giving you a truly comfortable, luxurious outdoor living space. We specialize in granite countertop surfaces for outdoor kitchens, granite deck caps, and granite fire pits. Granite is perfect for outdoor living because of its raw, natural beauty, its durability, and the luxury touch that it adds to any project. Here are just some of the outdoor accent products we fabrication and install using granite and other natural stone surfaces. Recycled patio pavers are a great way to spruce up your outdoor seating area. They're durable, easy to maintain, and make for a beautiful focal point. Patio pavers are available in 6x6, 6x9, and 1 1/4x12. Your outdoor kitchen is a way of life for you. You’re out there every day, as soon as the weather gets warm, until the last day before the snow flies. 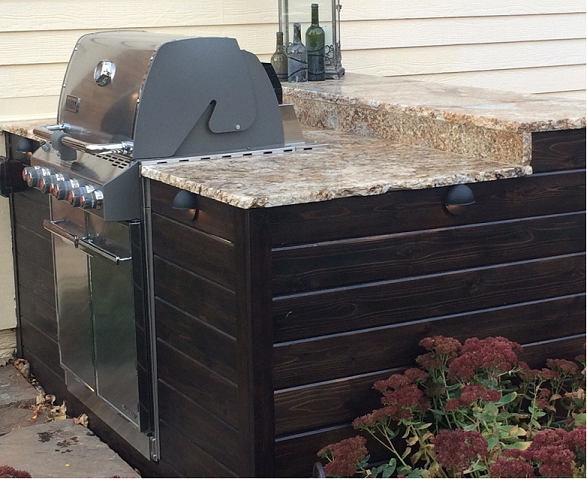 You need an outdoor kitchen that is durable, functional, and looks incredible. That’s where our granite counter top surfaces come in. We can customize your granite countertop surface in a way that works best for you. Have a custom grill that you want it to fit around? No problem. Have an odd-shaped space that you’re squeezing your outdoor kitchen into? We can do that. Do you want to create an eating or bar area that blends perfectly with the natural surroundings of your yard? Not only can we do that for you, but we specialize in it. You spent a lot of time and a lot of money building the perfect deck, right? So you want it to look incredible. You’re planning to spend a lot of time out there, and you want to be proud of your space. Your deck is already great. Our decorative granite deck caps can take it from great, to incredible, by adding a tremendous touch of class. But not only are granite deck post caps attractive, they’re also incredibly functional. The grain ends are particularly vulnerable to the elements, and our granite deck caps will protect the wood from damaging water, snow, and anything else Mother Nature can throw at your hard work. You can choose from a number of different styles, colors, and custom sizes when you choose Granite Accents. 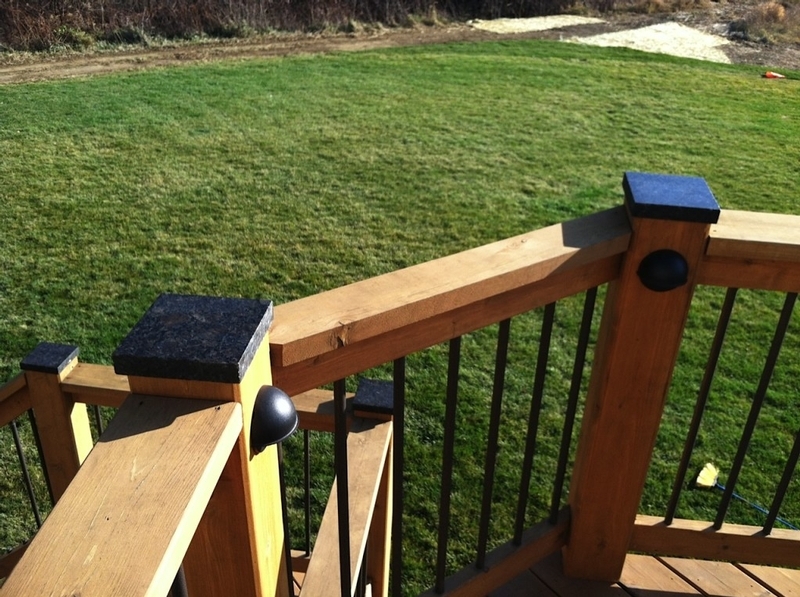 Add value, life, and a luxury touch to your deck today with our high-quality granite deck caps. Nothing makes an outdoor space complete like a fire pit. Sitting around a fire is a great way to end a long, hot summer day, or a way to enjoy the cool, crisp evenings of the fall. They are the perfect complement for every cookout, every family gathering, and every evening with friends. Fire Pits are one of the most popular outdoor accents trending today. Your fire pit should be more than just a hole in the ground. It should be classy, durable, look great, and provide you and your family with the safety that you deserve. 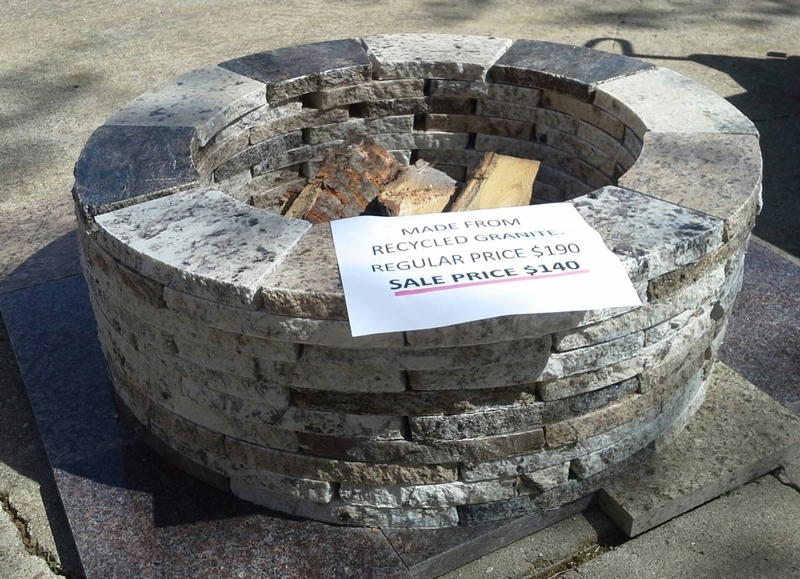 Pre-Fab Fire Pits are available in-stock for pick up any time at both locations. Colorado Springs, CO and Sioux Falls, SC. Our granite fire pits can be customized in a number of different ways to fit your home perfectly. We use top-quality granite, and can use polished granite on top for an extra touch of class and luxury. We can build you a round fire pit with one of our pre-fabricated fire pit kits, or build a rectangular one. Or fit your fire pit into a unique space, if that’s what you need. Whether you want a wood-burning fire pit or a gas one, our work with granite fire pits will stand out from the ordinary and provide you and your family with a fantastic place to make memories and enjoy the great outdoors. Do you have other grand ideas, but you’re not sure if they’re possible? Well, we like to believe that we can make your ideas reality, so just ask us. Here at Granite Accents, we’ll do everything we can to make sure your countertop is more than a countertop, but a huge part of your living space.